BAML is simply a compiled binary version of a XAML fragment. The XAML elements are converted into equivalent binary objects. This means that translating back from BAML to XAML is straightforward. The simplest way to view a particular .baml file as XAML is to use the .NET Reflector tool. 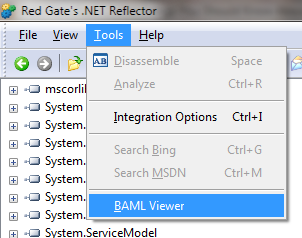 After you download the tool, download the BamlViewer add-in for Reflector. You’ll have to install the add-in (View | Add-Ins | Add). Once installed, you just open the executable that contains the BAML, stored as a resource. Then open the BAML Viewer from the Tools menu. The BAML Viewer window will open and you can then navigate to the .baml that you want to examine (found embedded as a resource). 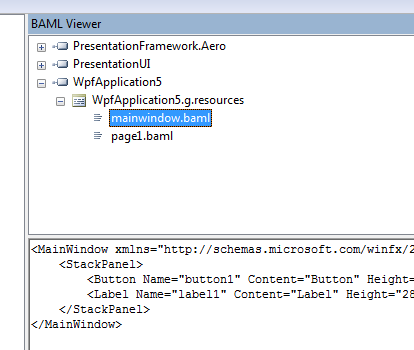 When you select the .baml file in the upper pane, the equivalent XAML will be displayed in the lower pane.